Updated volume and volume-anomaly graphs. Lincoln Sea & above CAA is a Rubble, while ESS Arm is much thinner and fragmented than in PIOMAS Graphic Data. Am I misinterpreting the Worldview of the ESS ice? Looks way thinner than PIOMAS August 31 suggests. I attach a table and two graphs. The 2018 line has been following the 2010's average for months now. I find it interesting this year that PIOMAS modeled thickness was a good predictor of the melting difficulty of certain regions. In both the Beaufort and the ESS, the areas that appeared to be thick initially have indeed lasted quite a long time while other areas in the same seas have already melted. The same happened in the Laptev as can be seen by the latest animation, melt has progressed rather rapidly until reaching a local region of thicker (modeled) ice, where melt slowed down considerably. Even in the Lincoln Sea, modeled thickness has been low since the February lift-off + warmth event, and indeed this year saw this location open up during late summer in an unprecedented way. I note that PIOMAS is considered more accurate on the general volume that on the specific location it is to be found in, especially as it uses the crude NSIDC grid. So in spite of that, it had a good predictive capability this year. Ya, no. I have been saying this for a while. This is a good/great model, but when it is obviously wrong, we should acknowledge it as such. 2 months ago, PIOMAS was modelling much of the ESS as 10-15 feet thick. Need I say more? Not true. 2 months ago, June 30th, PIOMAS was modelling a small part of the ESS as up to 2.5m (8ft) thick, and much of the ESS as up to 2m thick. I was expecting a greater drop as well. But I don't think it is because of mismodeling, but because the Beaufort sea has all that excess of ice wrt other hotter years as Wip maps clearly show. Melting has been stagnant there with colder SSTs this August. Also, after all, there is still quite some ice in ESS, the melting there has been catching up due to weather but still is well above most 2010s. PIOMAS is quite low resolution so the ice-free areas average out with the last remaining thick floes. My AMSR2 derived Volume model is more detailed and shows gaps in the ESS arm. You're right. I misremembered that. Thanks. Not sure what I am thinking of. I remembered it as white. This model seems useful. Just curious: have you looked into correlations with Fram export? Nothing like data and facts. What is most intriguing is how the thickest ice has lifted off the CAA and appears to be heading toward the Beaufort/Chukchi Seas. Nope. Since the September minima are ranked similar to PIOMAS. I don't think my model gives any surprises there. "What is most intriguing is how the thickest ice has lifted off the CAA and appears to be heading toward the Beaufort/Chukchi Seas." The ice does appear more mobile and more compressible so I'm wondering how much that affects the fluctuation of thickness. It seems that any movement towards the center of mass would rapidly caused ridging, which being newly formed would, when pushed away from the main body, equally rapidly break apart. I'm guessing that the Beaufort residual is formed from the more durable remnants. Well written as usual Neven. In a couple of days we'll also have the PIOMAS mid-month number, to more or less wrap up this melting season. In a couple pf days we'll also have the PIOMAS mid-month number, to more or less wrap up this melting season. Nothing there yet, perhaps waiting for a definite minimum. The PIOMAS gridded thickness data was updated, last day available is 15 September. Volume calculated from the thickness gives 5.00 [1000km3]. On that day volume still decreasing, so the minimum may not have been reached yet. Attached are the daily volume and volume-anomaly graphs. And the Fram Strait volume non export graph. Is there any way to tell if this is lack of ice to export or lack of wind/current to move the ice? As I follow Arctic Sea Ice for only two years, has there always/mostly been a "non export" in summer in previous decades or is this a recent feature, probably due to a substantial loss of MYI since the late 00s/early 10s? It's normal that export is lower in summer and much higher in winter. 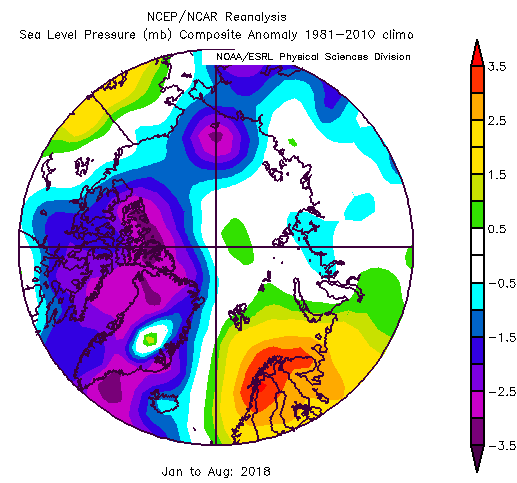 And I have the impression by watching and by reading people here that summers since '13 with low pressure systems dominance tend to export ice by dispersion toward Svalbard and FJL, while summers with arctic dipole persistence tend to see more Fram export, 2007 being the example of that. easiest way to see that this is logical is to assume that there is zero ice and export will be zero accordingly. in winter there is a lot of ice and therefore there is much more to be exported. in addition to tha there is more peripheral ice in winter and peripheral ice is more exposed to major currents as well as less protected than the ice in the central arctic which is surrounded to a very high degree by land. Stephan, there is a grey line plotted as step graph in the background. It is the averaged (1979-2017) monthly Fram volume export. Export has been low most months this year. There is more data available now (also pre-2000), so I intend to update the animation at the end of this year. Wipneus, what is the geographic line that serves as the export threshold? Having swiped the data from Wipneus, here are four volume images that very much mirror the JAXA tables and graphs I post. There is still a cold fresher current flowing out of the Fram (and also a deeper flow that is part of the AMOC). It's a dynamic system, the rate of heat input is enough to melt the ice that is flowing south. Why is that? Perhaps less heat is needed because the ice is moving slower or is thinner. There also could be more or faster heat input from the Atlantic, or perhaps it is just better mixing. Thank you all for your answers and explanations about the "Summer Fram non export". "Satellite-derived sea ice export and its impact on Arctic ice mass balance." The first author is Robert Ricker. The article is published in the journal: The Cryosphere. I can't post a link because I'm on my phone, but with that information you should be able to google it and get the full paper. Make sure you look at the paper that was published today, and not the draft that was released for comment back in February. Drift and thickness changes seems to be the conclusion... I wonder if they considered extra heat and mixing or declining thermocline. This years appearance of open water north of Greenland might be related and throw another data point into the mix. Yes works for me too. Yes - thank you. Google Scholar failed me! They only looked at three input parameters - Ice drift, thickness, and concentration. They didn't consider variations in heat input (that there has to be, to cause the ice to melt). On my AMSR2 thickness model Sea Ice Volume didn't change in September (fairly typical behavior) Only the distribution shifted from the Eurasian-Pacific side towards Canada and Greenland. New PIOMAS gridded thickness data has been has been released until 30 September. The official volume data is still waiting, I will use volume here computed from the thickness. Attached is the September animation. The updated daily volume and volume-anomaly graphs. The freezing "hiatus" is causing the anomaly to dip. Fram export is starting to take off, still far below the 2001-2017 monthly average (the grey step-line in the background). The 2018 minimum is now available, that means some old graphs focusing on extrapolating the future volume data have been updated as well. Here is a linear regression of the annual minimums over the full range (unlike the previous graph). The extrapolated zero ice is around 2032, not different from previous year. Wipneus, firstly thanks for those updates. Just wondering how is the fram exporr defined.? Volume passing through particular line or is it just volume located in an area compared to a previous time ? Reason i ask is that this autumn much of eastern Greenland was very low in ice and in the past few weeks, much of the open water has iced over. In other words it wasnt ice that arrived down from the CAB, but was frozen in situ. It's volume passing through a certain line shown in Wipneus' response up-thread to my similar question. Looking a the animations on the Freezing season thread, I think a lot of the growth in the Greenland Sea was actually export, though not all of course. I am using Sum_of ( heff * uice * HTE) for a row of gridcells spanning the Fram Strait (I posted a map a few days ago). Heff is effective thickness, uice is appropriate velocity component and HTE the width of the gridcell along the row. Summarizing, in situ freezing is not considered it is pure transport.